yeah but im not liking it at all tbh. I have set different things and still no complete trades seems to happen.... not working like a thought. Im very disappointed,Do you have a reinbursment option? sorry to hear that you are not happy with it so far. But the experience is just as good as the exchanges work at a given time. Yesterday many exchanges were having difficulties. What kind of problems are you having? You can also always contact support@marginsoftware.de. Well first of all the software just crashes randomly. I have bitdefender but i do not want in any way delete it for running a bot.The software also keep slowing down and lagging when cancelling/creating new orders in a way you CANT use it at all. furthermore let me make clear im far to be expert at all, but i tryed different configurations and altcoins: i tryed btc/vtc, neo/btc, btc/dash, btc/monero with no results. All the times i ran them the software either crashed or did not made any adaptation to the market. I mean, whats the point in cancelling a buy order if it set itself right away at the same rate? I watched the tutorials on youtube but they are give little informations Imho. Im not mad or anything, im just sad because i was so hyped for this software that i find just incredible i can't even complete ONE order of buy/sell margin. im really open to try again with some advice, but right now im just not happy at all with the product. First off, have you sent us a mail to support@marginsoftware.de yet? I can't match your bitcointalk name with your mail so I don't know who you are. Secondly, we have given instructions on how to correctly exclude leonArdo from bitdefender to ensure it doesn't crash. Have you done this? Thirdly, you are wondering how people are making money because for you it crashes. Don't you think that that could be something to do with your setup? We have thousands of customers who do not experience what you are experiencing. Please get in touch and we will look into your situation. i just sent the email to the support. Its titled software issue. As for the instructions for bitdefender i did not know there was something to run correctly leonardo, can you post the info here? also about the thousands of customers who do not experience this, i never said they are not, im just reporting my experience with. It pretty much can be a problem of setup but the problem is the guide you offer on the site is not enough for an average user. Im willing to try some setup parameters if you want to tell me tho. i put the .exe in the whitelist of bitdefender, still no changes. software slows down till freezing when elaborting orders. message for jonathan who texted me in the PM: i cant answer this site is really slow atm, the page keeps crashing. I also asked on email for a contact of you to be able to talk in private. No one is answering tho. As I said before, there is currently a problem with Bittrex and their API, so no one can place orders. This problem is on Bittrex's side and not leonArdos. please send me some contact to talk with you jonathan as i cant in this forum's Pm. AFAIK the whole support team (including Jonathan) has support@marginsoftware.de available to them. Bittrex has put dozens of pair into maintenance today as the whole world seems to have BTCMania. They will make it right for you, they are a good bunch. The software is going very slow and messy with bittrex. I find hard delays and like 5 or even 10 seconds lag about refresh (when i compare with bittrex website directly). I had the same experience with Bittrex. I believe the lag is API related to some extent. I'm running in demo mode and have switched to Bitfinex... which is WAY better than my experience with leonArdo using the Bittrex API. Sequential tabbing across fields and buttons does not seem to work in leonArdo. Is this because of the way the software is written? or can this feature eventually be implemented? It would be nice to simply be able to hit Tab then Return to place an order instead of having to track the mouse curser from another screen over the Yes button. Speed can sometimes make or break a trade. Yeah, sadly you need to have a somewhat fast and low latency internet connection for leonArdo to work really good. My actual setup is now to have a dedicated atom/celereon SoC based itx machine with an actual ubuntu install on it. Running three separate leonArdo instances (they luckily share one ~/.leonardo folder w/o hassle), for each exchange a separate leonardo so to speak (i have 3 licenses). Which is .... FUBAR .. especially on fast moving markets where you lose a lot of advantages from the software and a lot of trade opportunities too. And that happens to me with a somewhat guaranteed stable 50:10MBit/s vdsl connection too. On your uplink side, sadly leonArdo uses a _lot_ of bandwidth over time, there are tons of requests going between leonardo and the exchanges, multiplying per open pair. So maybe try it on one exchange with just only one, two or maybe three open pairs to check if your internet connection might be the problem. P.s. : My plan just includes 50MBit/s downlink and 10MBit/s uplink, thanks to our FTTB install, my actual modem and connection is capable of easy 90,3MBit/s downlink and 31,2MBit/s uplink. Anyways, i have a 300GB/Month data cap, where leonardo _easily_ eats up at least 40~80GB/Mon of traffic in average. P.p.s: I can confirm the random crashes/segfaults. After switching to ubuntu and having them run natively on that, they just segfault from time to time for no clear reason. Replace it with something that doesn't trigger false positives all the time. Crashes usually seem to occur when your internet is sheite or there are no resources available(RAM/CPU). Either that or your exchange is going bonkers, which is happening quite a lot lately. If you feel funky, set up a VPS with X2Go, costs 5 bucks a month and works like a charm. There are a couple commands available that can keep your bot running after you disconnect, forgot their names. 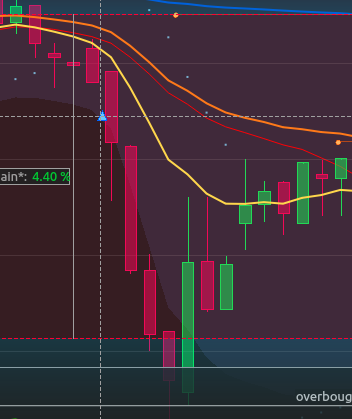 I must say, this bot handles upswings or downswings terribly, and it's a massive heartache to see a 30% gain that the bot wasn't programmed to comprehend. I really hope the coming update will bring change in that. Sure, I could use x2go and so on (I'm on linux), but that would completely rend mobile useless, so in case of an emergency I might not be able to do anything at all. Having a native API would totally kill it! If you have a timeframe of "3 hours", then at a given time at night, the buy point has been evaluated as a "lowpoint", and therefore bought. And right after the bot purchased the coin fell. But given the 3 hours interval it was counted as a lowpoint. I havn't tried it yet, but ppl say, "set the min. eff margin negative", and the bot should sell off, and keep reevaluate until a new lowpoint is found ( Which could be a the bottom of the price drop). ^Anyone feel free to correct me, but this happend to me aswell the other day. Thank you for all the assistance! This is the exact process I followed as well.